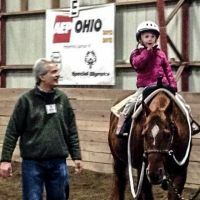 I work as a therapeutic riding instructor teaching kids with emotional, cognitive, and physical challenges the art of horseback riding. The program is supported by an army of volunteers who dedicate their time and energy into ensuring that the horses are well cared for, and the students have safe and enjoyable lessons. By walking alongside the horse and rider during the lesson, volunteers often develop strong attachments to the students they work with, and vice versa. Mr. Bill was one of our first volunteers in the program. From the very beginning, he walked alongside Georgia, a bright, beautiful, and chatty “four, almost five-year-old” student. When Georgia was anxious, he would calm her, distracting her with questions about her day, or her favorite color, or toy. When she lost focus while riding, Mr. Bill would redirect her attention and guide her through the task at hand. For 18 months, Mr. Bill was a solid presence in Georgia’s weekly lessons. Sometimes, she would arrive for her lesson at the end of a particularly tough week, unwilling to provide anything more than monosyllabic answers, until Mr. Bill coaxed her out of her shell, and she would transform before our eyes into the bubbly, giggly child we recognized. Their relationship warmed my heart; their mutual love and adoration was a joy to behold. Mr. Bill passed away on December 29, after fighting for his life for two weeks from the trauma caused as a result of a senseless tragedy that devastated two families and left the rest of us who knew Mr. Bill in shock. Since the accident, there has been a tremendous outpouring of support, love, and care for the Lewis family. The community at Dreams on Horseback pulled together to provide emotional and practical support for Mr. Bill and his family; organizing a schedule for delivering meals to the hospital as he lay in intensive care; offering rides to appointments for his children so his wife could stay by his side; collecting donations for Christmas gifts; and taking turns to sit with the family as they waited and prayed for his recovery. What took me by surprise wasn’t the community’s response to the tragedy, but how much a part of the community I realized I had become. Due to my husband’s job, I’ve been living a relatively nomadic life in the last few years, moving through countries, states, and cities. As someone who loathes small talk and the ”getting to know you” phase of relationships, this lifestyle has been challenging for me. It takes me a while to adjust to my surroundings, figure out with whom I can let my guard down, and find a sense of belonging. I feel like I usually have a good gut feel of where and how I fit within groups and organizations that I join, and am sensitive to boundaries that need to be softened or held firm. Up until this moment, I had situated myself at the periphery of this community, not through lack of desire to belong, but through fear of becoming too attached. Mr. Bill’s unassuming, humble, and loyal presence had touched many lives and as the tragedy unfolded, it became clear to me that our “barn family” was responding to this event in the way that Mr. Bill lived his life: through selfless service to others, and with love, respect, and integrity. Belonging to this family means taking responsibility and care for others and, above all, being present wholeheartedly. As Mr. Bill took a turn for the worse, and the community pulled together to comfort each other and offer strength to his family, I was flooded with appreciation for having a place within this incredible group of people who had welcomed me with open arms. Recognizing my fear of attachment as an anticipation of grief allowed me to surrender into the comforting arms of this community. In much the same way as Mr. Bill would coax young Georgia out of her shell, the message was clear: be here now and find joy through connection, because we can never anticipate what comes next. While grief may become reality, should my nomadic existence or other events intervene, the joy of connection in the moment was worth the risk. I am proud to be counted as part of this family, and know that I will have their support as I continue to work with Georgia without her beloved Mr. Bill. I am filled with deep gratitude for this lesson, his last gift to me, and honored beyond measure for having been graced by his presence.